CASE wheel loaders offer the next generation of power and performance with the industry's most impressive gains in efficiency and fuel economy. With upgraded hydraulics, these machines provide you with superior productivity and performance on any jobsite. Best in class horsepower and exceptional torque deliver power second to none. 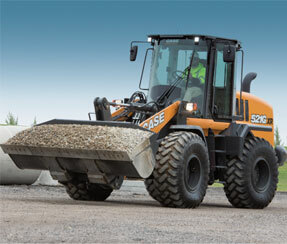 CASE wheel loaders utilize Selective Catalytic Reduction (SCR) technology to meet Tier 4 emission standards. SCR requires no regeneration and no new filters. Just add Diesel Exhaust Fluid (DEF) when you refuel, and you're ready to go. The CASE ProCare warranty comes standard on all wheel loaders and offers the most complete maintenance and support program in the industry.